Quirky Jessi: The Most Expensive Junk Food--Truffle Burger Anyone? The Most Expensive Junk Food--Truffle Burger Anyone? 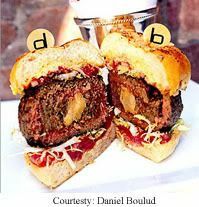 His version of the classic ground beef burger is stuffed with red wine-braised short ribs (off the bone), foie gras, a mix of root vegetables and preserved black truffle. Hold the ketchup though, the pièce de résistance is a double helping of fresh black truffles on top. This burger, if you can call it that, is served on a homemade toasted parmesan and poppy seed bun with a touch of fresh horseradish, oven roasted tomato confit, fresh tomato, red onions and frisée lettuce. And, of course it comes with a side of French fries -- or pillows of pommes soufflé if you prefer. ...is almost scary. Not your type? How about this fancy dessert instead? 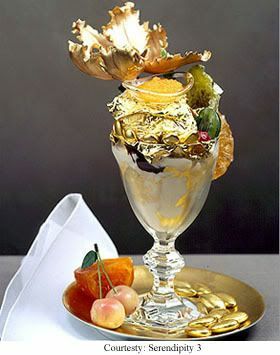 The restaurant's golden opulence sundae is covered in 23-carat edible gold leaf and is also rich in flavor thanks to Tahitian vanilla ice cream infused with Madagascar vanilla beans and chunks of rare Chuao chocolate from Venezuela. In lieu of Hershey's syrup and a maraschino cherry, this sundae is drizzled with one of the world's most expensive chocolates, from Amedei Porcelana, and then adorned with candied fruits, gold covered almonds, chocolate truffles and marzipan cherries. The dish also features a dollop of sweet Grande Passion caviar served with a mother of pearl spoon and a gilded sugar flower. The whole shebang looks as good as it tastes, served in a Baccarat crystal goblet (yours to keep) with an 18-carat gold spoon (not included). Check out this article for three more incredibly expensive foods you probably haven't heard of before, including macaroni and cheese with white truffles and a philly cheese steak gone seafood. Isn't it amazing how they can turn ordinary food....typically 'cheap', fast food type food....and turn it into something extraordinary? Personally, I wouldn't touch any of it (I'd be afraid I'd break it and have to pay for the crumbs that fell off), but whatever floats people's boats, I guess....and their wallets! I'm really hungry and that burger looks really good to me. But who the hell pays that much for food? Apparently the rich do, lol. The sundae mentions it being perfect for a sweet sixteen....do you realize what I could do with that thousand bucks instead of eating it??? When I waitressed at a fancy restaurant I would cringe when someone spent $800 on a bottle of wine. I wanted to say, "Why don't you take it easy tonight, buy a $200 bottle tonight, and use the change to help a girl out with a college education." HAH! I wish I would spend that much money on my own personal fat fest! Some people have more money than sense. What kind of chef enjoys putting together things like that? Lol, yeah, I can't imagine having that much extra money....and I certainly can't imagine spending it on fluffy, frilly food like that, heh. Thanks for stopping by, guys!